Engineered stone is a composite material comprising of rock and resin. It has been accepted as part of the natural stone industry, although many conservative members still show some resistance. However the product has gained popularity, mainly in the kitchen work top industry, through good marketing and some advantages over natural stone. Silestone® is the leading brand of Cosentino. DuPont™ Zodiaq® quartz countertop surfaces are composed of advanced composite material made with pure quartz crystals. Compac Marmol & Quartz is specialised in the manufacture and distribution of agglomerate marble products. 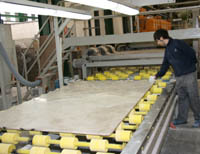 Technistone, a.s., is an innovative manufacturer and supplier of composite stone.